Faiths Together in Lambeth along with Tulse Hill Forum supported an initiative by one of our Member Organisations, FAST (Families Against Stress and Trauma), whose Director is our FTiL Secretary, Saleha Jaffer. We were invited to St Martin's Community Centre, Abbots Park Road, Tulse Hill, SW2 3PW at 11.30am on Thursday 14th March. We heard from 5 speakers (Buddhist, Christian, Hindu, Jewish and Muslim) for 5 minutes each, sharing with us their choice of the most important things to say about their faith in just 5 minutes. Then there was time for discussion. Then a free lunch was provided and we finished by 1.30pm. 27 Belmont Close, London SW4 6AY (just off Clapham High Street). Save energy, save money, keep well and warm! Learn about growing food locally! 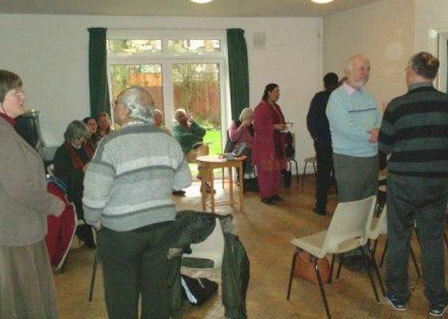 Faiths Together in Lambeth held an interfaith harmony breakfast at Streatham Friends Meeting House on Thursday 14th February 2013. FTiL members and friends were invited to come and share breakfast with friends of all faiths and none anytime between 8am and 10am, and 24 people attended. 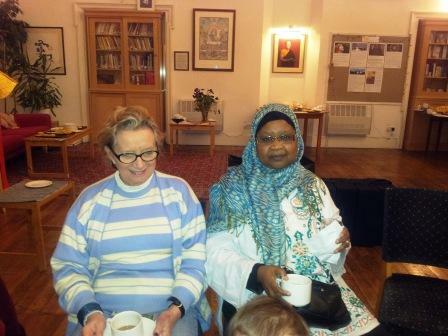 The breakfast was held in association with the UN's annual World Interfaith Harmony Week. Anton Bartick organisedYouth Inter Faith Board Games in the Upper Hall at the Karibu Education Centre in Brixton on Sunday 25th November, starting at 4pm. This was supported by the Inter Faith Youth Trust as an event in national inter faith week and was focused on the 16-25 age range. The centrepiece of the event was an Inter Faith Board Game that tests knowledge of basic facts about the main faiths. Supporting games were used as ice-breakers. Lambeth Lambeth Country Show in Brockwell Park usually takes place over a weekend in July but this year (its 38th) the Olympics and Paralympics pushed it into mid-September. Faiths Together in Lambeth proposed an inter faith stall (a first) and South London Inter Faith Group responded enthusiastically. In the end 7 organisations collaborated to put the stall together and 19 people from 5 faiths combined to staff the stall throughout the Saturday and Sunday. Large numbers of people attended the Show. Of course, relatively few of them came to visit the inter faith stall but still, it felt like something well worth doing. 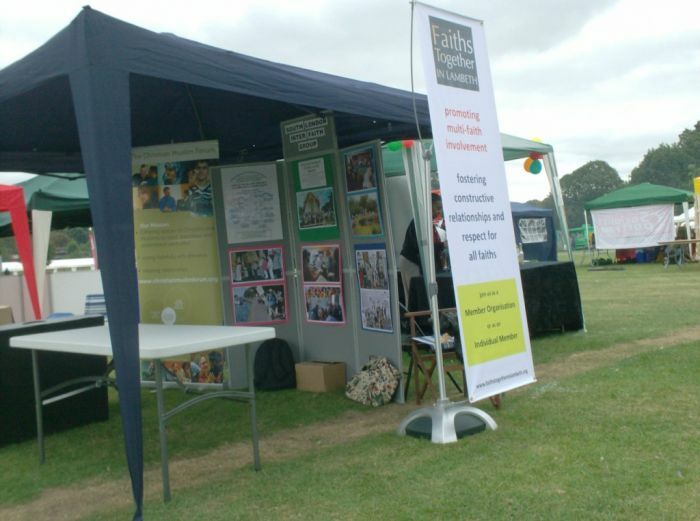 The dates for next year have been announced (it’s back in July – the 20th and 21st) and already there are some ideas for an inter faith stall mark 2. Lambeth Country Show will take place in Brockwell Park on Saturday 15th and Sunday 16th September and will be open from 11am until 6pm on both days. 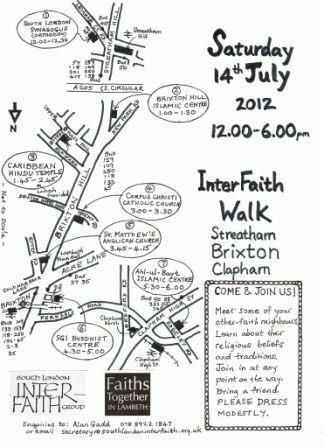 There will be an Inter Faith Stall organised by Faiths Together in Lambeth in collaboration with South London Inter Faith Group and Jamyang Buddhist Centre and with support from London Boroughs Faith Network, South London Branch of the Council of Christians and Jews, the Christian Muslim Forum, Local Initiative for Faith and the Environment and Lambeth Multi-Faith Action Group.You will find the Inter Faith Stall at stand number ZW34 in the Charities West Area, not far from the Main Entrance to Brockwell Park at Herne Hill. 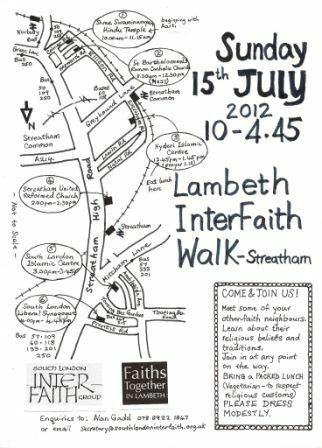 The main purpose of the stall is to inform the public about inter faith activities in the Borough of Lambeth and to encourage participation in these activities. Do come and visit us. And please would you let FTiL know if you could sign up to be present for, say, a 2 hour slot of your choice? That would be very helpful. 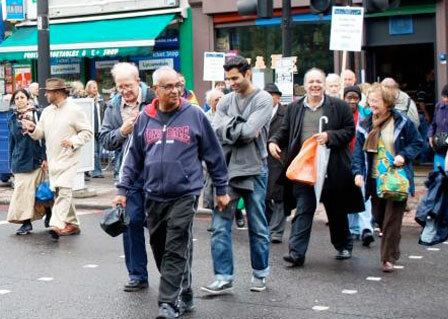 South London Inter Faith group coordinated 12 Inter Faith Walks across south London during the weekend of 14th and 15th July 2012, just before the London Olympics. Two of the Walks were in Lambeth. Buddhist, Christian, Hindu, Islamic and Jewish centres were visited. With thanks to Sally Smith. Hard copies available from FTiL. With thanks to Sally Smith. Hardcopies available from FTiL.